To know what’s exactly beyond this shiny blue sky has always piqued our interest for exploration. This has further driven us to innovate and build technologies advanced and robust enough to carry individuals into space. This has, thus, ushered a completely new era of private space exploration startups who are working towards the idea of providing common man a closer glimpse of outer space. British billionaire Richard Branson-owned Virgin Galactic is one such company and has today successfully complete its second unpowered gliding flight test before the end of this year. The company performed the glide using their suborbital vehicle, VSS (Virgin Spaceship) Unity, which was unveiled back in February. It was conducted just two weeks after the first glide test which helped the company to gather precious data for their reusable flight rocket. The VSS Unity, attached to the WhiteKnightTwo carrier aircraft, took off from Mojave Air and Space Port in California on December 23. It was an unannounced flight test and the facts for the same have been gathered through the company’s Twitter account — which was relaying the info about the same in real-time. The flight had been conducted to alleviate even a single element of doubt about the technicalities of the spacecraft. Virgin Galactic’s chief executive George Whitesides also shared his enthusiasm for the successful flight tests ahead of the holidays. In a tweet, he mentions that it is the most perfect way to end this year and the company is now pretty confident about the new Unity spacecraft, which packs in additional safety features to prevent crashes. The first glide flight for the VSS Unity, scheduled for November 3, had been delayed by a month due to a technical fault found in the aircraft. Virgin Galactic is not taking any chances after the tragic spacecraft crash which happened about two years back. It had then resulted not in the loss of only the spacecraft but also one of the pilots and several other injured members. 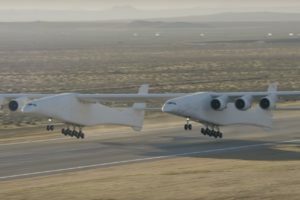 But with two successful glide tests under its belt, the company is now slowly moving towards its goal of starting powered test flights in the coming year. It is currently taking baby steps and progressing ahead with several scheduled (as well as unscheduled) test flights to complete all objectives before moving on to carrying people to glide in space and glance at the expanse of darkness. If no other delays or technical faults are found, Virgin Galactic could move ahead with rocket-propelled tests in 2017. The commercial SpaceShipTwo flights, which has already seen over 700 customer sign ups, should be expected to begin soon enough. It can carry up to six cargo passanger in one glide flight to the top of the atmosphere (the starry or blue sky).